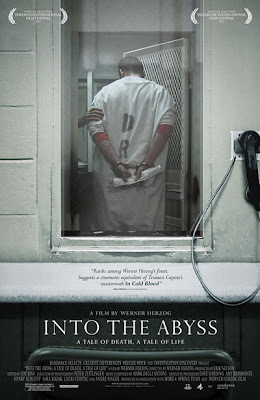 Into the Abyss is a documentary about Michael Perry, a death row inmate in Texas. It details his alleged crime (murder, in case you're wondering), how it affects the people around him and the victims' families, and Perry's final journey. It's not the kind of film you want to see, but I'm glad I saw it - it's thought-provoking, and the fact that it's a documentary gives you a real glimpse into these people's lives that a film based on the story wouldn't necessarily provide. One thing I don't like about the film is actually crucial to the making of it - the interviewer, presumably the director of this documentary, Werner Herzog. I was actually struck by how stupid and insensitive some of his questions are - one (he?) may argue that he intends to prompt a reaction from his interviewees, but a lot of those questions, I think, are totally unnecessary and only show how unskilled he is as an interviewer, though of course he is a much celebrated figure in German cinema. I haven't seen any of his films, and I don't think I'll be rushing to see any after this. Into the Abyss is thought-provoking because of the subject matter (capital punishment) itself, not because of how it's treated in this documentary.